An Irish-medium school or ‘gaelscoil’ is a national school in which everything is done through Irish, and which uses the immersion education method (explained below). Irish-medium schools are funded by the State under the same conditions as other national schools, and follow the standard primary school curriculum. Irish-medium schools welcome children from every linguistic, cultural, religious and socio-economic background. Irish-medium schools are run by various school patrons. The patron is the authority in charge of school management. Patrons provide guidance and support for school principals and boards of management, and the patron is responsible for the promotion of the school’s ethos. A school’s religious ethos is determined by its patron. Some Irish-medium schools are denominational (Catholic), others are inter-denominational (with a shared Catholic and Protestant characteristic spirit) and others are multi-denominational (where no particular denominational religion is taught). 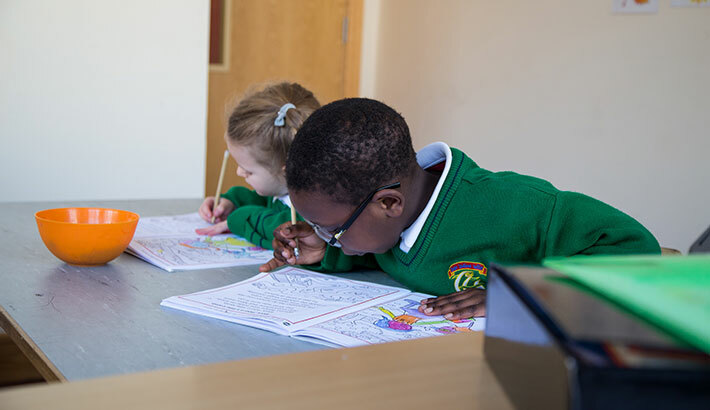 Immersion education is a system which helps children to become fluent in Irish naturally, by giving them daily experience of an Irish-speaking environment. This means that all subjects, apart from English, are taught through the medium of Irish right up until 6th class. It also means that Irish is the language of communication in the school, both inside and outside the classroom and in the playground. In this way, children’s fluency in the language is supported. What is an Irish-Medium Primary School?